Today I woke up pretty sullen about the whole question of tropical fruit. (Hey, coffee drinker, I’m eating the banana. You got a problem with that?) And I did have the banana, sliced on my LOCAL Cascadian Farm cereal. A simple, tasty breakfast! Today’s plan for lunch was to make soup out of the rest of last night’s butternut squash. After dinner last night, to get a jump on today’s cooking, I went ahead and pureed the squash, and I’m glad I did, because I ended up making a fairly complicated soup. (I got the recipe from foodnetwork.com; it was posted by Michael Chiarello back in 2007.) I had to scale up the quantities to match my more than three cups of squash puree (this was a hefty linebacker of a squash! ), so I doubled the recipe. Tip #1: I went ahead and made the toasted-spice rub that he described. Very good! But I wouldn’t encourage tossing the toasting spices to keep them from burning; stirring does perfectly well. I’ll be vacuuming up coriander seeds for a week. You get started by sauteing onion, celery, and carrot–AND cinnamon sticks!– in olive oil; salt and pepper the mixture, and add your broth (plus spices–I added coriander, plus some sage and a tiny dollop of balsamic vinegar, since I didn’t roast the squash with them). Let it simmer, then add your squash puree and let it simmer some more. Take out the cinnamon sticks. I threw in some of the spice rub as well. More simmering. Now puree the soup mixture. Tip #2: Do not, I repeat do NOT, over-fill your blender with hot soup. (Don’t ask.) About one serving at a time is good. Serendipity!–My friend Jan invited me out for a glass of wine and appetizers. (We always go to Bai Pai, a Thai place with a great happy hour.) Crab won-tons, spring rolls, calamari, and spicy green beans. Mmm good. Plus, of course, a couple of glasses of wine! So no peanut butter pasta; all those ingredients are pantry staples and will keep. And I’m not hungry enough for a salad either. But I did whip up the eggplant and green onion side dish, just because I had the ingredients fresh on hand, it’s more or less a Thai dish, and I love it! 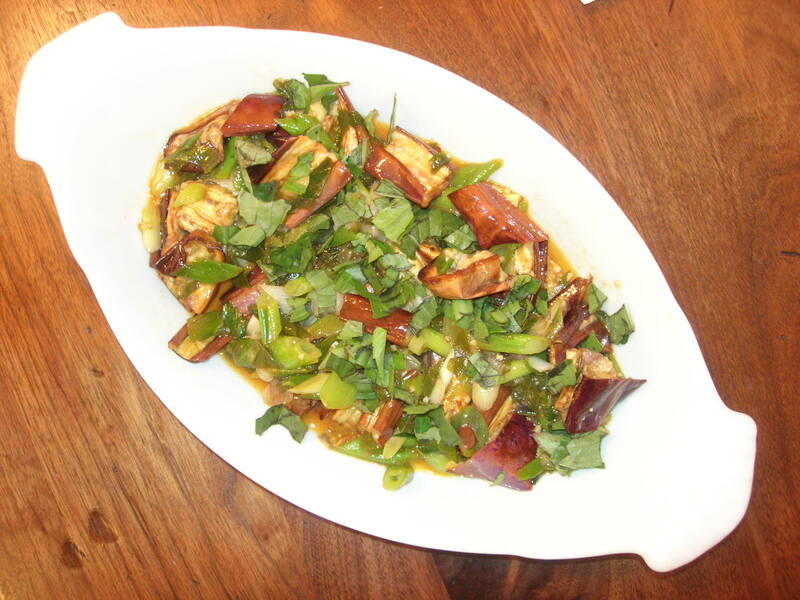 (Roast the eggplant; stir-fry the green onions, add the lemon juice-garlic-sriracha-fish sauce, add the sliced eggplant and stir-fry briefly, dish it up and sprinkle with Thai basil!) I’ll eat it over rice one of these days. Overall score for Day Three: B+, for attitude! 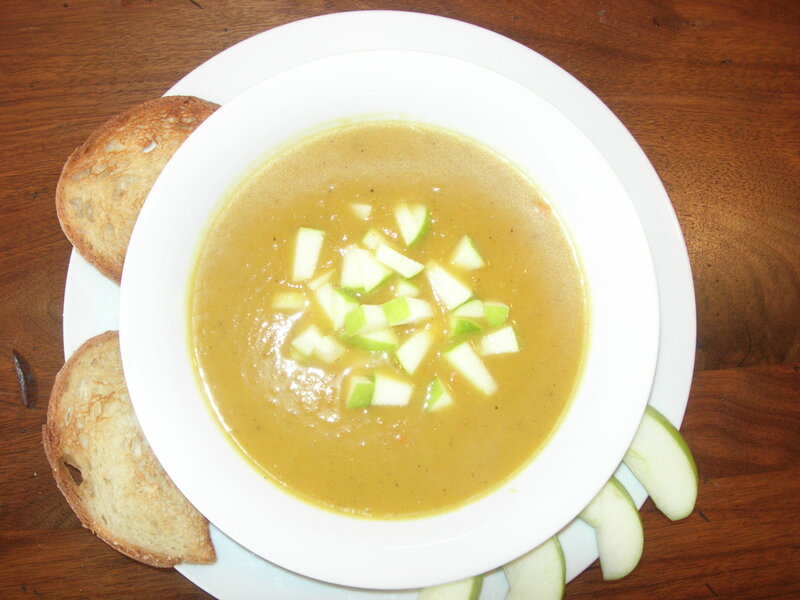 This entry was posted in Meal planning and tagged Asian eggplant, home cooking, meal planning, squash soup by judyramey. Bookmark the permalink.